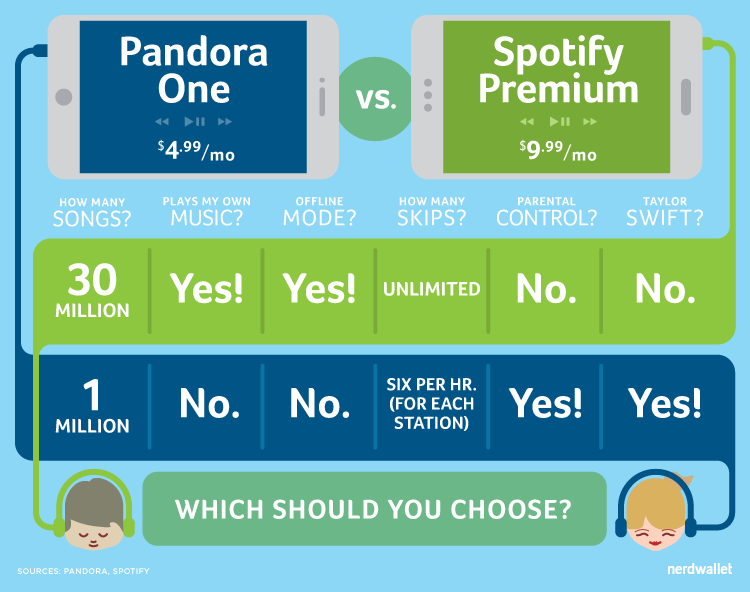 Pandora One or Spotify Premium: Which Should You Choose? Both Pandora and Spotify are music streaming services — but that’s where most of their similarities end. Pandora operates like a radio station. Users can design playlists around favorite artists and genres, but they can’t simply listen to an album straight through. On the other hand, Spotify users can pick the music they listen to and even add tunes from their own libraries. Whether you’ll prefer Pandora or Spotify depends on whether you want to discover new music or listen to old favorites, and on which service has the artists you want. Spotify’s library is much larger, but Taylor Swift famously pulled her music from the service late last year, though she’s still available on Pandora. If not being able to stream “1989” and the extra $5 per month aren’t deal breakers, Spotify is a better bet. But if you’re still not sure, you can sign up for free trials of both Pandora One and Spotify Premium. And you can always use both without paying — though you’ll be stuck with ads until you buy a subscription.